Who’s ready for summer? After a 19 year hiatus, your Spokane Civic Theatre is. The winner of 8 Tony Awards, including Best Musical – told by Duncan Sheik and Steven Sater through “The most gorgeous Broadway score this decade” (Entertainment Weekly) – Spring Awakening explores the journey from adolescence to adulthood with poignancy and passion. Based on Frank Wedekind’s once-scandalous 1891 expressionist play, this landmark musical is an electrifying fusion of morality, sexuality and rock & roll. Join this group of late 19th century students on their passage, as they navigate teenage self-discovery and coming of age anxiety in a powerful celebration of youth and rebellion in the daring, remarkable Spring Awakening. 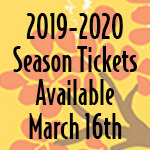 Single tickets on sale March 15, 2019. Ticket prices vary. Tickets are nonrefundable. Exchanges may be made for the same stage only. Dates and titles subject to change.